Paper dolls get an ingenious upgrade with ‘Baboo’ clips by designer Shahaf Ben Abu. Baboo was created to enable children to express their feelings therapeutically via drawings that they could engage in interactive play. 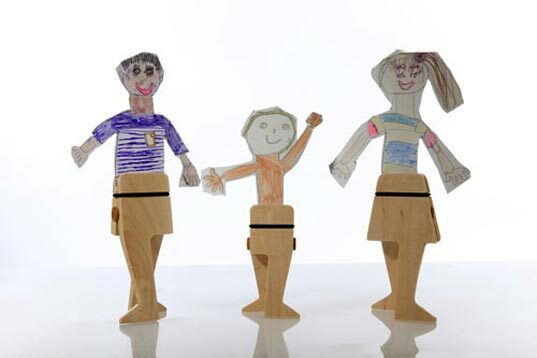 Each clip is equipped with legs, (there’s also one clip that serves as a barren tree trunk awaiting a fruitful existence), so kids can easily attach artwork of family members, fantastical creatures, animals or imaginary friends, bringing them to three dimensional life. Made of beech, maple and silicone bands, we think Baboo is great for storytelling. These talking tools take an analysis of children’s drawings to a much deeper level. Instead of asking tots about what they drew, little ones may actually animate their pictures and give voices to the characters with the help of Baboo. The set also includes a box that doubles as a puppet theater — because all the world’s a stage. Paper dolls get an ingenious upgrade with 'Baboo' clips by designer Shahaf Ben Abu. Baboo was created to enable children to express their feelings therapeutically via drawings that they could engage in interactive play. Each clip is equipped with legs, (there's also one clip that serves as a barren tree trunk awaiting a fruitful existence), so kids can easily attach artwork of family members, fantastical creatures, animals or imaginary friends, bringing them to three dimensional life. Made of beech, maple and silicone bands, we think Baboo is great for storytelling. These talking tools take an analysis of children's drawings to a much deeper level. Instead of asking tots about what they drew, little ones may actually animate their pictures and give voices to the characters with the help of Baboo. The set also includes a box that doubles as a puppet theater -- because all the world's a stage.